The older generations of Auto Disconnect Apple Charging Cord has been proven to be 5 times durable than other cables in the market. Today, we take it to the next level. Our latest lightning charging cable has been bent over 12000 times along with twist, drops, bumps and magnificently tolerated all of them. We assure you that the structure of this USB cable for iPhone will definitely withstand any of your struggle on your everyday usage. These cables are manufactured with complete authorization of Apple and have been designed to work flawlessly and efficiently with your iPhones, iPad, iPod and all other devices that support a Lightning connection. We are certain that when it comes to quality and durability, the Auto Disconnect Apple Charging Cord will give you the absolute peace of mind as it surpasses most cables out there. It is made with Zinc alloy, a strong braided cable and a vibrant glowing light for easier charging even in the dark. On top of durability, the Auto Disconnect Apple Charging Cord also offers advanced safety because of its Auto Disconnect capability. We know you often forget your iPhone plugged in for long hours and it might cause problems like overcharging, short circuits and even fire. 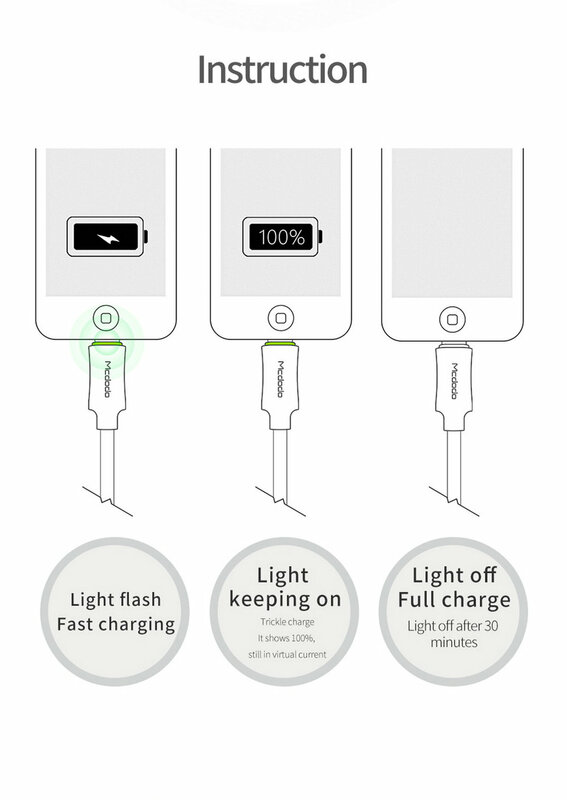 This lighting cable has an advanced feature with light indications that automatically turn off when your smartphone is fully charged. It is designed with a built-in Smart IC to ensure safe charging and make you feel at ease. These cables are designed intelligently to quickly charge your Apple devices. The light starts flashing when you plug a device to indicate fast charging. The light stays on until the phone battery reaches 100% and it will automatically turn off to indicate that the device is fully charged mostly at an average of 30 minutes. This is definitely the most functional, durable and safe USB Lightning Cord that every iPhone owner must have. Get yours now!